Are you ready for a holiday at a tropical destination, and are you looking at trips to Bonaire? Anyone who wants to experience a wonderful sun, sea, and beach holiday on a paradise island, will book a trip to the "Diver's Paradise". Bonaire is not just the most beautiful of the ABC islands, with a beautiful underwater world, it is also the least touristy island of the three. Do you like rest, relaxation, and breathtaking nature, and would you like to stay in a luxury apartment? Then Bonaire, and the brand new Resort Bonaire, are your ideal holiday destination. If you are planning your trip to Bonaire yourself, you can book a stay at Resort Bonaire. But some tour operators also offer package trips including a stay at our resort. You will stay in a luxurious and fully furnished holiday apartment for 2, 4, or 6 people. The floor-to-ceiling windows, soft colors, and natural materials create a relaxed living atmosphere. Of course, as a guest you can also use our park facilities. Take a refreshing dip in the pool with a sandy beach, lie down with a book on a lounge chair under the palm trees, or drink a cocktail at the pool bar. The children will enjoy themselves in the water or at the playground, and thanks to the free WiFi, you will remain up to date on all the news. A holiday at Resort Bonaire is the ultimate relaxation. Bonaire trips exist in all shapes and sizes, in high and low season, including accommodation and car rental, or other amenities. You can put your holiday to this Caribbean island together yourself, or book an all-inclusive holiday. In any case, you will have a wonderful stay at Resort Bonaire, and enjoy all the beauty that Bonaire has to offer. The island of Bonaire has many sights that you can visit during your trip to the Leeward Antilles. You can visit the donkey sanctuary, Bonaire national marine park, or the Terramar museum. Would you like to take a sporty trip? Then snorkeling, diving, kite surfing, or a mountain bike tour are an excellent plan. Experience your trip to Bonaire the way you want. If you are looking for trips to Bonaire, and accommodations, then you have come to the right place. Resort Bonaire is a small paradise and luxury resort, far away from the crowds, but at just a 10 minute drive from the capital of Kralendijk. 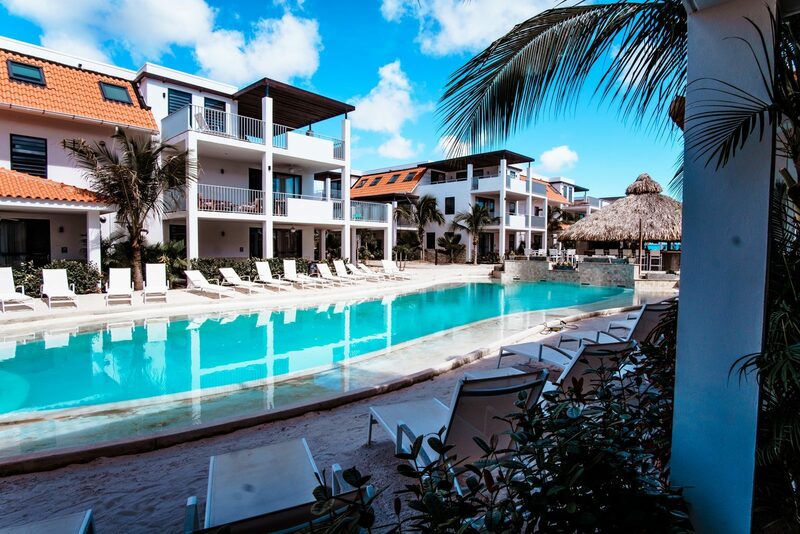 At Resort Bonaire, you can rent a luxury apartment for 2, 4, or 6 people - perfect for a holiday for two, or the whole family. Upon arrival at the resort, you will be warmly welcomed by the friendly reception who will hand you the keys to your luxury holiday apartment. Your apartment is equipped with all the comforts you could wish for; a complete kitchen, nice bedrooms and beautiful bathrooms, and a stunning view through the floor-to-ceiling windows. The resort facilities, including the swimming pool, pool bar, snorkel rental, a playground, and free WiFi, are at your disposal. The flight from Amsterdam to Bonaire takes about 10 hours. From the plane you can already see how the white beaches beautifully stand out against the azure sea. Bon bini to Bonaire! The first thing you will notice upon arrival is the pleasant temperature, the relaxed atmosphere, and the friendly faces. If you want to see more of the island during your stay on Bonaire, it is best to rent a car. Resort Bonaire is less than a 10 minute drive from the airport. Resort Bonaire is perfectly located for a diving holiday on Bonaire. In the area, there are several diving schools, dive sites, and tour operators who will take you out to the most beautiful places in the sea, or to Klein Aruba for a diving trip. 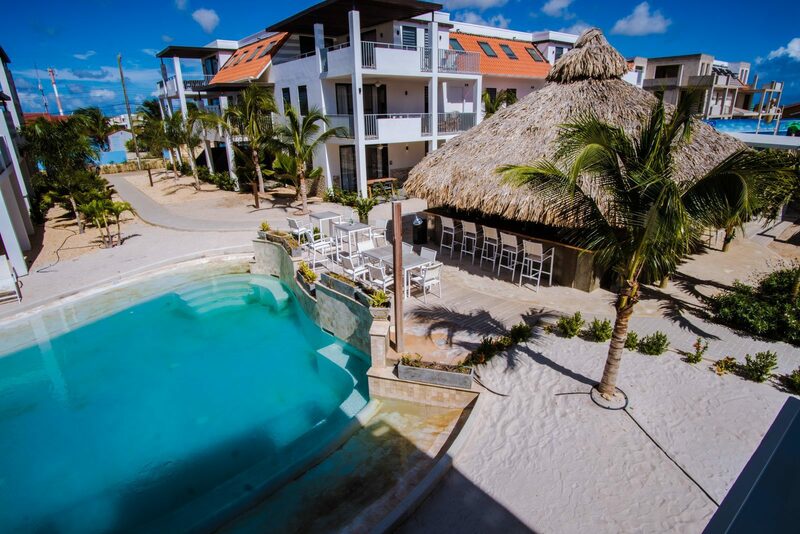 Resort Bonaire offers you every comfort to enjoy a well-deserved holiday. The pool, the pool bar, and lounge chairs will get you to relax.